« How Do Psychics Connect Long Distance? Over the years I have learned to distinguish between normal dreams and psychic dreams. In my late teens, I was fortunate to discover the book, An Experiment with Time by J W Dunne, and this helped me a great deal in understanding and mastering the nature of my dreams. 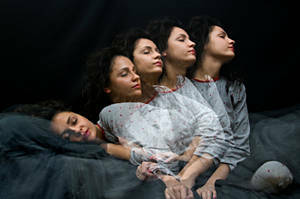 Psychic dreams differ from our usual psychological dreams. Our normal dreams are simply an opportunity for our subconscious mind to process the events of the day, or an attempt to resolve issues or concerns we currently face in our lives. Psychic or lucid dreams, however, are prophetic in nature. These special dreams offer us actual glimpses into future events and outcomes. Not only do we dream about the future, I also believe that we generate or create our future while we are in the dream state. I also believe that some of the events we shape during these dreams are what we later experience as moments of déjà vu. So, how do you know you had a psychic or lucid dream? The experience seems to be different for everyone. My psychic dreams are usually very vivid and colorful, almost like watching film footage or a news clip on television. I also hear sounds or voices very clearly (or not at all), and I often see symbols that have a specific personal meaning or significance for me. I typically have these dreams as I drift off into sleep, or just before I wake up in the morning. Many of my precognitive dreams occur a couple of days before the actual event, but some arrive months, or even years in advance. The best way to explore your dreams, and gain greater access to its prophetic content, is too start keeping a dream journal or diary. I live with a notepad next to my bed, and every morning I record everything I can remember about the previous night’s dreams. A good place to start is to recall the last thing you saw or felt, just before you woke up. Be patient, it won’t come without some effort at first, but over time, and with frequent practice, it will become easier. Review your notes from time to time. You will be surprised at how much of what you dream actually does come true later. The precognitive dreams I have range from the intensely serious, to the completely hilarious! Although I have become used to having these dreams, and accept them as a natural part of my day, I am sometimes surprised, or even confused by them. Several months ago, for instance, I had a recurring dream about a man and child digging up old bones in my backyard? They were so excited about each one they found! I was totally perplexed, until I heard that one of the most significant anthropological discoveries to date had been made, by an American professor who works here at a local university. They were out for a walk, and his son was the first to discover some of the fossils of a new hominid species, which lived almost two million years ago. This happened at the Cradle of Humankind in the Magaliesburg, which is not too far from where I live in Pretoria, South Africa. More recently, I had a strange dream about a man speaking under a red flag. His voice gradually faded out. The more he tried to speak, the less one could hear him. I had no idea what it meant at the time. The only sense I could make of it was that it was something symbolic about Hitler or Nazi Germany? I should have connected the dots, based on what was revealed later. Soon after I was busy reading for a client (she is a journalist), when I suddenly decided to end the consultation. I told her to switch on her mobile phone. I sensed that she was about to receive an urgent phone call and advised her to return to her office. Her phone started ringing as she got into her car. Later, she told me that Eugène Terre’Blanche, a prominent right-wing political figure in my country, had been murdered in his home. The well-known emblem of his organization is a black and white symbol on a red flag! Then, on a much lighter note, in 1998 I dreamed that a blonde woman from South Africa would win a big prize in the USA, due to the fact that she was a prostitute and a serial killer! My family and friends thought I had finally gone down the rabbit hole…to be honest, I had my own doubts too! Of course, I had a good laugh many years later, when Charlize Theron hit the mark in 2004, by winning the Oscar for Best Actress for her role in the film, Monster. Thank you for the quotes along with your experiences and book tips. I was once told by a friend that deja vu is simply the fact that an angel has walked that path before us and is letting us know we’re on the right track. I took that with a grain of salt and used it to learn that not all dream (pre-cog or otherwise) are verbatim and we must interpret. What a relief that was!! Thank you, again. Thank you so very much for sharing this,as of a few days ago,my nephew phoned me, now its been a few years since him and I spoke to each other,but he explained and caught me up with his life of the last few years. He said that if your on the right track with life,that you will know,due to all the signs that appear,and bring eithr good thoughts,memorys and feelings. Thanks for your comments Lynn. Yes, your nephew is spot on with his approach to soulful living. We all have an inner guidance system that tells us whether we are going in the right direction or not, if only more of us will listen to it more often…. Your dreams are definitely part of your overall intuitive compass, so do pay attention to them, as well as “gut feelings”, emotions, physical sensations and external signs, which could be anything from an image on TV to a bird outside your window. Pingback: Why Don’t Psychics Win The Lottery? I have had precog and psychic dreams wince I was 12/13. They usually come as recurring dreams. For instance, I dreamed about my now husband in three dreams that recurred and connected picking up here the previous one left off. I met him the following Valentine’s Day. Normally my dreams like this are not disturbing. I can astral travel and find many of the things in those experiences informative and at times serious, just never emotionally disturbing. In the past few years I have dreamed of walking through war zones trying to help the injured around me in what I thought of as the Middle East. I could smell the bodies. Recently, those dreams have morphed into apocalyptic dreams of protecting my friends and family from zombie attacks. Normally I would slough those off as anxiety dreams or having watched something on tv. This is not the case. I keep having these dreams occur, and they are realistic like my previous precog and psychic dreams. Bright, vivid color is the determining factor for my dreams for me to tell the difference. I’ve read the dream interpretations out there about disconnected feelings in relationships and anxiety about work and being overstressed. My husband is always with me as a unified force in the dream, and we are actively planning protective actions and structures to keep our family safe. The dreams keep adding people into or family unit and the most recent one was one in which we were in a community, researching ways in which to defeat and cure the epidemic/apocalypse. This type of dreaming runs in my family. My dad would have dreams of natural disasters and the people in them 2 days before they would happen. I tend to feel very ill right before a disaster occurs (Challenger exploding and 9/11 are the most memorable). The zombie dreams are really disturbing for me, since I have this talent and I really prefer the future to be bright and sunny.